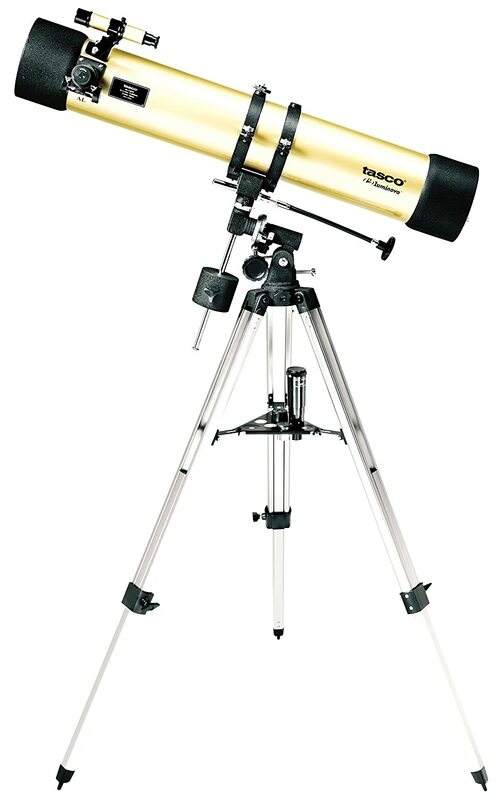 I purchased this telescope for my 12 yr. old daughter as a Christmas present. I found myself using it as much as she does. I was never into astronomy until now. The optics are clear for a beginner and it is fairly simple to use. For any one just starting out this is a reasonable telescope. This was my first scope bougth for me as a Christmas present 10 years ago. I used it as my only scope for about 3 years. It the did duty as my primary grab and go for another 5 years. I still use it on occasion. It is a fine starter scope. Functional, well built, and nice looks. The tube has some important advantages: Its primary mirror appears to be parabolic. This is very important as it gives the observer the ability to achieve magnification in excess of 100X. The focuser has a diamitor of 1 1/4″. This is important as it enables one to use a wide variety of eyepieces. However the scope/mount does have some problems. It comes with a bad finder, a 5 X 24. It can be used, but it makes finding deeper hard to find objects very difficult. The secondary mirror is supported by one arm which causes the scope to easily lose collimation. The accesseries (especially the 3 X barlow) need to be replaced asap. The EQ1 mount is not able to properly supporting the scope. This results in excessive vibrations when focusing. None the less, as is, this scope/mount combo is very usable. It has enough aperature to bring in some deep space objects including almost all of the Messier group. It will provide very good views of the planets and the moon. A big help is will result if one replaces the 5 X 24 finder with a larger 8 or 7 X 50 finder. This will make object location much easier. Also, it is imperitive to replace the eyepieces. House brand plossls will provide a much better view than the suppliefd Huygens. The Huygens are full of distortin especially as magnification increases. This will result in noticiable better views. A cheap finder can be found for about $50. House brand plossl eyepieces abound for about $30 each. A decent barlow is also needed. Again, a hous brand barlow will cosat about $30. It is not necessary to replace the mount. One may add weight to it center point to aid in stability. Also, since this is a reflector one does not have to extend the mount legs. This will also add to stability. In all, this is a very good starter scope and one that maybe morphed into a grab and go sometime in the future. A person can use it “as is” till he or she decides to grow into this hobby. At that point the upgrades mentioned above will provide much improvement and satisfaction with the views till a new scope is desired. At that time, this 114MM maybe used as a grab and go. I highly recommend this type of starter scope.